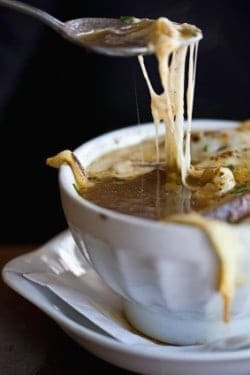 Brennan’s makes some hearty onion soup. Onions are gently sauteed in butter, and when caramelized perfectly beef stock is added. Their recipe is slightly different than most onion soups with the addition of an egg yolk and cream for extra richness. 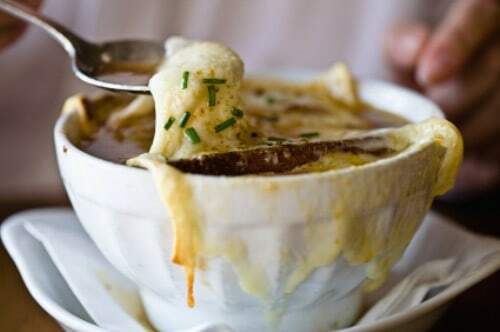 Make Brennan’s Onion Soup at home. In a six-quart soup kettle melt butter, add onions and reduce heat to very low, cooking until onions are melted down. Be careful not to brown in the first stage of cooking. Add flour and cook 5 to 10 minutes more, stirring occasionally. Blend in stock, salt, and bring to a boil. Reduce heat and simmer about 15 minutes. Remove kettle from heat. Beat together egg yolk and cream. Add a little of the soup and mix quickly, then add to soup kettle. Serve in soup cups with toasted rounds of bread or croutons and sprinkle with grated Parmesan cheese, buttered breadcrumbs. Brown under broiler flame and serve. Just finished a wonderful bowl of this soup. Was easy to follow the instructions and this is a keeper! Again I love onion soup! This one looks good I’ll have to try it!